On June 9, 1992, Captain William Pinkney sailed his boat, Commitment, into Boston Harbor after completing a 22-month solo circumnavigation of the globe, a voyage that covered 27,000 miles and took him to many fascinating lands. From the middle of the ocean and from the lands he visited, Captain Bill communicated with students in Boston and his native Chicago via satellite, ship-to-shore radio and home video dispatches. His ever-vigilant friends in the United States learned lessons in math, science and geography, delighted in the exotic sights Pinkney showed them and worried when he encountered rough water and violent storms during long stretches at sea. Then they welcomed him home, a new hero and prime example of dedication and commitment. 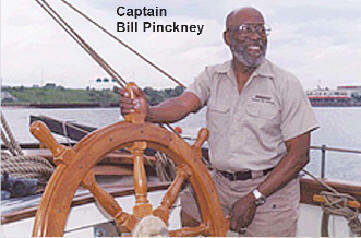 Bill Cosby narrates Bill Pinkney’s high seas adventure, The Incredible Voyage of Bill Pinkney ($14.98) a biographical documentary about the first African-American to sail around the world. MPI Home Video presents this winner of the prestigious Peabody Award on DVD August 28, 2007.